Core Drill Rental – Core Cut – M1, is available for rent in Rochester NY, Ithaca NY and the entire Western New York region from the Duke Company. 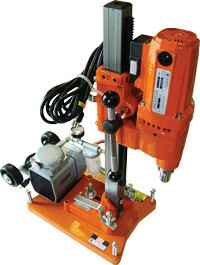 The rental Core Cut M-1 combination rig without vacuum available for rent, features a 2.5 inch mast, 6 inch wheels for portability, and leveling screws. This precision drill enables drilling in tight areas for a wide range of contracting jobs.